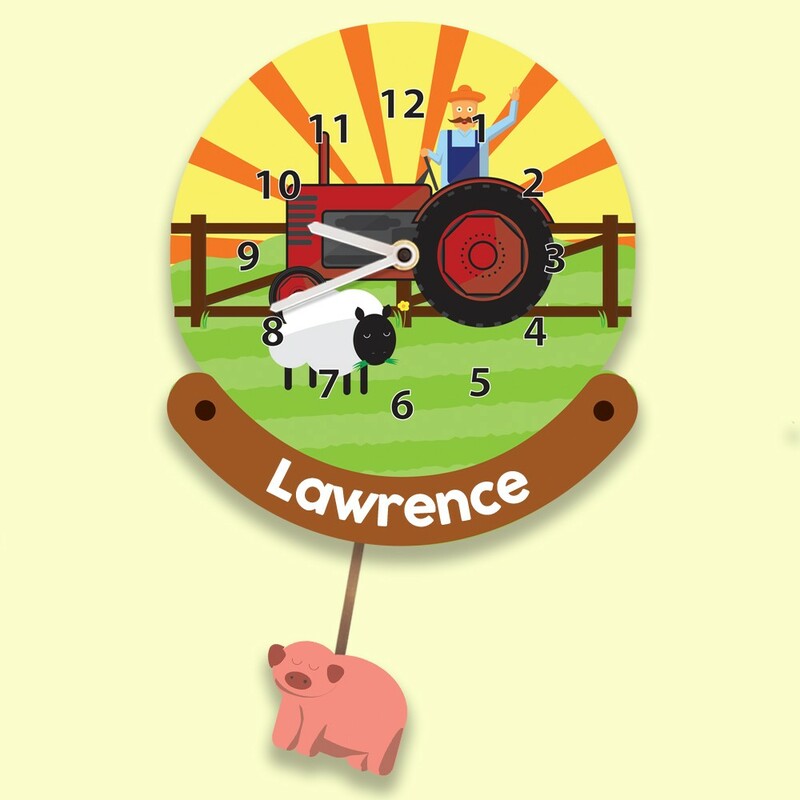 Budding farmers will absolutely love this fun wall clock, personalised with a name and complete with a swinging pendulum! 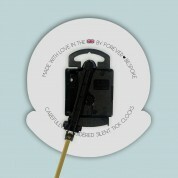 Its silent tick mechanism it is perfect for a nursery. The bright colours will stand out in any room and as your child gets older they will love to use it to learn the time. Old MacDonald is getting help from his animal friends as the sun rises on another day at the farm. He is giving you a friendly wave from his bright red tractor! A yellow sun burst shines in the background, and a hungry sheep grazes on the dewy grass. Your child's name is featured in bold letters. There is even space for two names, if your children share a room. 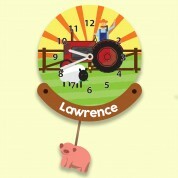 A cute little pig swings on the pendulum, adding a special touch. It is designed and made in the UK and features a quality German Quartz movement which compliments the quality of the British design and manufacture. We think our silent wall clock would suit any occasion, especially for a boy celebrating a first birthday, a Christening, Dedication or Baptism. It would make a great gift for starting school too. 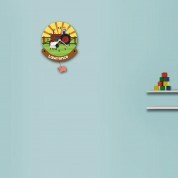 Other designs are available.